Instructors can now access assignment, test and SafeAssignment attempts that need grading from a new Needs Grading page accessed in the Grade Center section of the Control Panel. 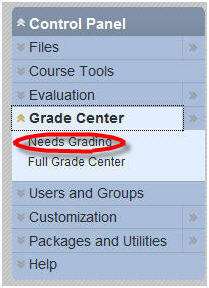 On the Needs Grading page, instructors can view how many attempts are ready for grading and sort and filter the items. Attempts are placed in a queue for easy navigation among items when grading or reviewing. Once an attempt is graded, it no longer appears on the Needs Grading page.